It was a little more than a year ago that our coworker came back from Denmark with a copy of Soundvenue magazine, covered by a woman with severe bangs, a Valerie Plame headscarf and very red lips. We looked into this Jenny Wilson and found a Swedish star who had all but escaped American interest. 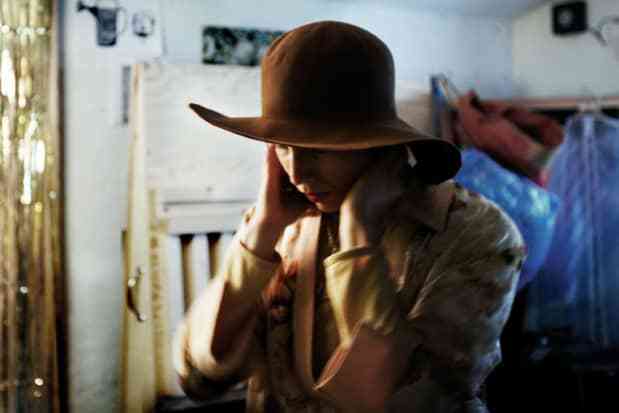 We picked up a copy of her record, Hardships, which she'd released herself, and soon put her in our 2009 summer issue, her giant hat swooping across two pages. We've loved listening to her tiny percussion, wailing sax and her somewhat theatrical, booming voice. Last fall, we had her over during CMJ to play her first US show at the Levi's® FADER Fort, which she did in a giant turquoise muumuu. Naturally. In August, Hardships will finally be released in the US, on her own label, and she'll be making it stateside for shows, as well. "Only Here for the Fight" is on that album, though we strongly recommend seeking out the whole thing. Download: Jenny Wilson, "Only Here for the Fight"